Running concurrently with the Van Vlissingen Collection exhibition is a show of works on paper by the Flemish painter and etcher Jozef Van Ruyssevelt downstairs in the Hôtel Lévis-Mirepoix. The Fondation Custodia acquired works from his estate that include twelve etchings, a sketchbook and a set of gouaches. The Rijksmuseum in Amsterdam owns a virtually complete collection of Van Ruyssevelt’s graphic oeuvre; the Fondation has worked with the Rijksmuseum’s Print Room (the Rijksprentenkabinet) to stage the exhibition. 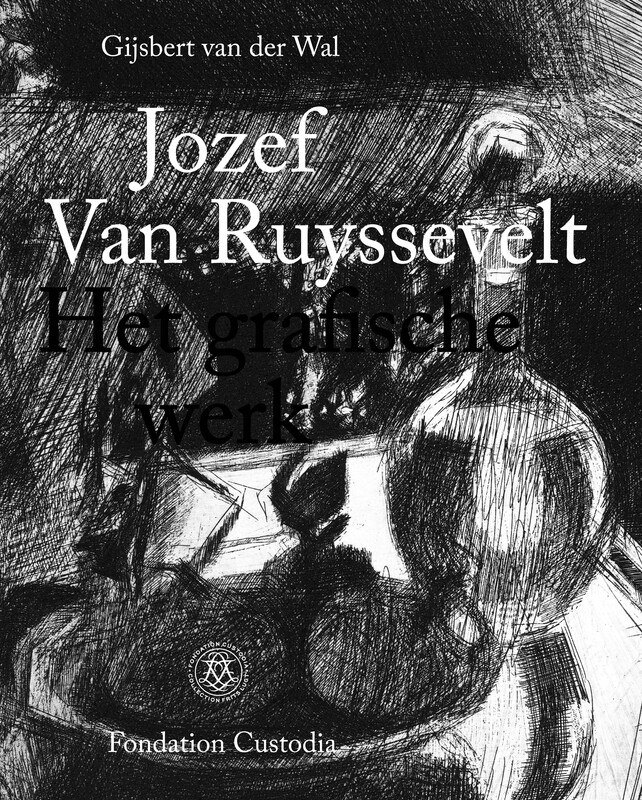 The exhibition focuses on Van Ruyssevelt’s etchings. 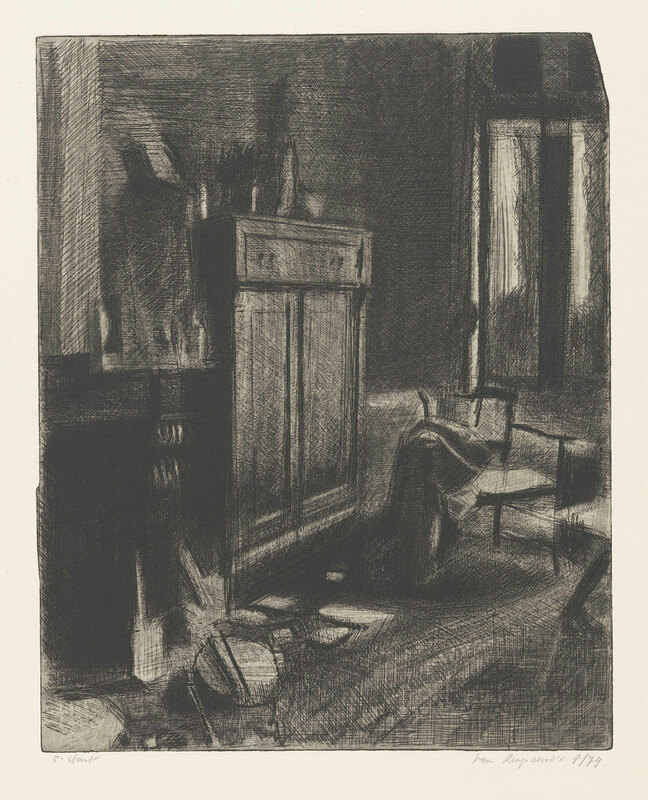 Often dramatic prints of undramatic subjects, they include views, interiors with chairs and cupboards, still lifes with bottles and pot plants. In the last state of the etching Studio View (1979) a little light entering from outside is faintly reflected in a painted cupboard. Hatching creates a sense of twilight in the room. You squint to look beyond those etching lines, but they get closer and closer together; it becomes ever darker towards the corners. The shadows under the cupboard and in the fireplace are velvety black voids. Quicksand for the peering eye. View in the studio, 1979. Sometimes, amidst all that black, something suddenly shines white, as white as the paper on which the etching is printed. The glass table top in Glass on Glass (1980), for example. In the shadow in front of this patch of light stands a fruit bowl with three pieces of fruit, and on the fruit in the centre there is a leaf silhouetted pitch-black against the white. There is always something bearing down heavily against the light. Viewed close up, the black leaf has no fixed outlines: it seems to be a shape cut from fabric that has started to fray at the edges. And what is it attached to – a small gourd? A mandarin? Van Ruyssevelt’s graphic art is all suggestion. You recognize a still life or an interior in general terms, but the details remain undefined. As densely as he hatched it, he still left everything open. An oeuvre catalogue of Van Ruyssevelt’s prints, with illustrations and detailed descriptions of all two hundred etchings and related work in other techniques, accompanies the exhibition. This catalogue is published in Dutch and French. The exhibition differs somewhat from the book. A selection of his graphic oeuvre is surrounded by much work in colour – gouaches, pastel drawings and a few oil paintings. For the intimate world Van Ruyssevelt captured in his etchings was in reality brightly coloured, and he was highly sensitive to those intense, glowing tones. The combination with the work in colour enriches the perception of the work in black and white and reveals how the etcher transformed all these shades and nuances of colour into chiaroscuro contrasts.